Are you using a guest blogging strategy as part of your content marketing plan? If you aren’t, it’s time to start now. Over the years, there’s been plenty of speculation about the death of guest blogging, but the tactic remains one of the most effective ways to promote yourself and your business. Here are just a couple of examples to prove our point. Elna Cain used a guest blogging strategy to make a full-time income from freelance writing. 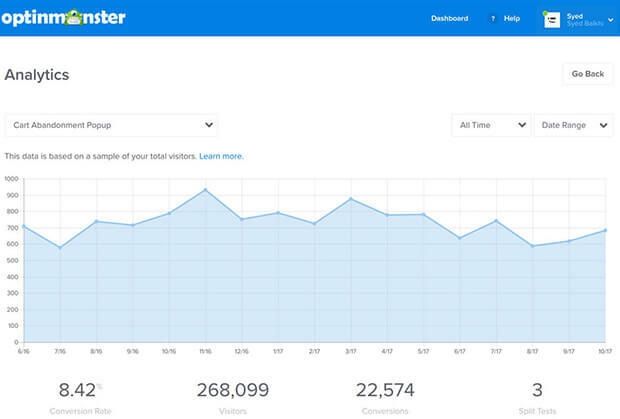 And Buffer used guest blogging to attract 100,000 customers. In this guide, we’re going to show you how to create and execute a successful guest blogging strategy. We’ll illustrate this with successful guest blog post examples. By the end, you’ll be able to use guest posting effectively to gain more visibility for your business and brand and improve lead generation. If you’re using content marketing, a guest blogging strategy can be a key tactic to boost your traffic and content marketing ROI. Now, let’s look at some more benefits of guest blogging. Guest posting is an excellent way to build brand awareness because the content you post on other sites tells new audiences about you. Those new readers may visit your site or landing page, which means guest blogging helps you attract new subscribers and improve lead generation. Guest blogging also builds trust. If trusted, authoritative sites publish your content, some of that trust rubs off on you. In fact, regular guest blogging can help others see you as an expert, which is great for the reputation of your business. When thinking about the benefits of guest blogging, SEO is one of the main ones. Building links from high-quality sites is a major SEO ranking factor and will improve your site’s position on search results pages. As a guest blogger, you’re not the only one who gains from the guest blogging strategy. The blog that’s hosting you does too. Since content creation is a major content marketing challenge, guest blogging helps site owners by making it easier for them to meet their content needs. Like every other marketing strategy, an effective guest blogging strategy starts with knowing your goals. After all, you have to know where you’re headed if you ever expect to get there. It’s essential to have a goal in mind so you can frame your bio appropriately and ensure the resource people see when they arrive delivers what you promise. It’s the best way to build trust with the new audience you’re attracting. Before you write a guest blog post, you’ll have to find a site that accepts guest authors and is actively looking for content. 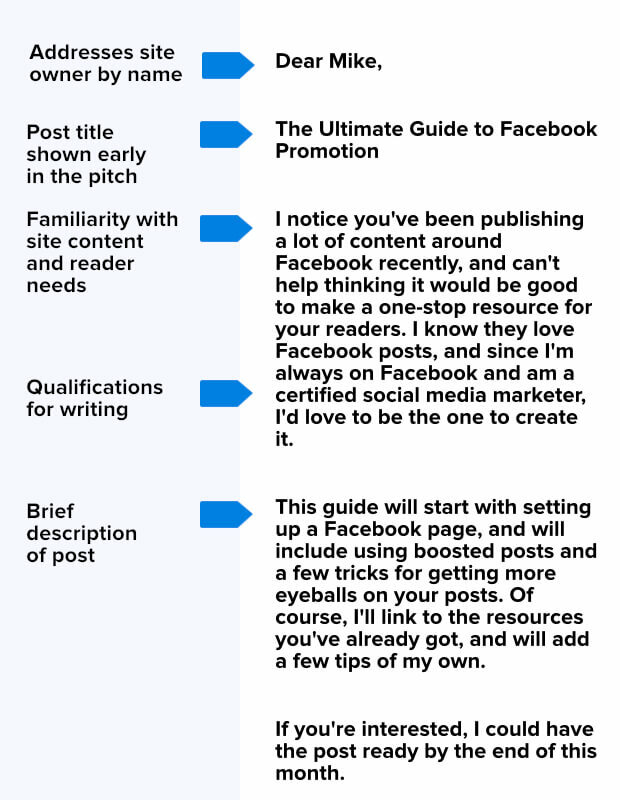 Beyond that, you’ll need to ensure that posting on the site will help you meet your goals. There are lots of ways to find sites that are happy to accept guest posts. See this list of search queries from Optimize Smart for even more suggestions. You can also use similar queries on Twitter. 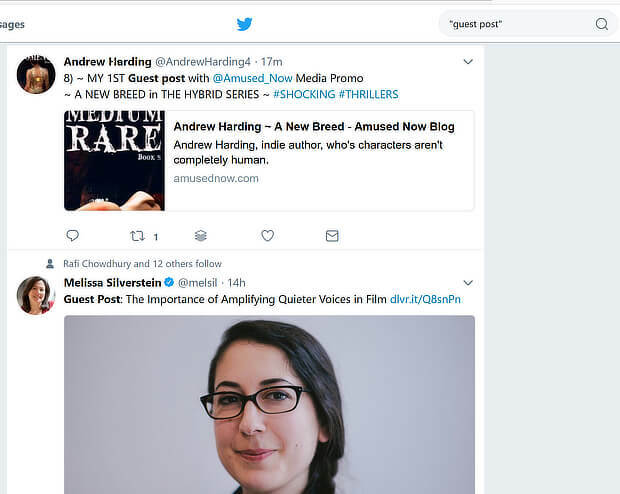 Just type “guest post” or “guest article” into the search box, and you’ll see a list of tweets showing guest posts. Whether you’re using Google, Twitter or another search source, make a note of the sites that are publishing the posts. You’ll need those later when it’s time to see if the opportunity is right for you. You can also find guest posting opportunities by checking out where your competitors are guest posting. Since most people share their guest posts to enhance their reputation, you can find this out by following your competitors on social media or subscribing to their email newsletter. Another way to find this information is to see where their inbound links are coming from. To do this, login to SEMRush, and go to Domain Analytics » Backlinks. Type the URL of the site you want to check into the search box. 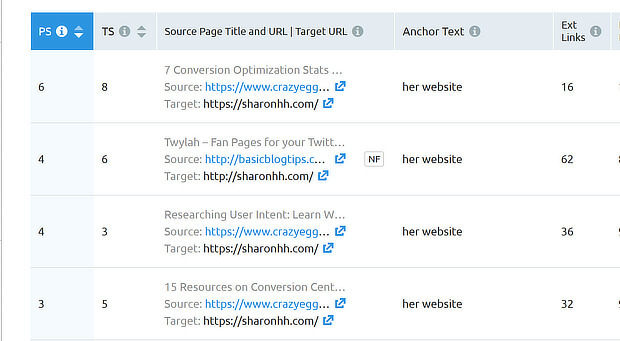 When you get the report, you’ll be able to see the actual backlinks, the anchor text, the referring domains, and more. This information will help you find more sites that accept guest posts. For example, in the screenshot below, we’ve clicked on one of the anchors to find the sites that include that phrase. Finding the sites is only one part of the equation. You also have to figure out if those sites are worth your while, and will help you meet the goals you set for your guest blogging strategy. Here are some areas to assess. Pick one of the sites you identified above to get started. First, use Moz’s Open Site Explorer to check the domain authority for the site you’re considering. This tells you if the site is well regarded online, and whether it will provide good value in terms of links, and possibly traffic, if you guest post there. 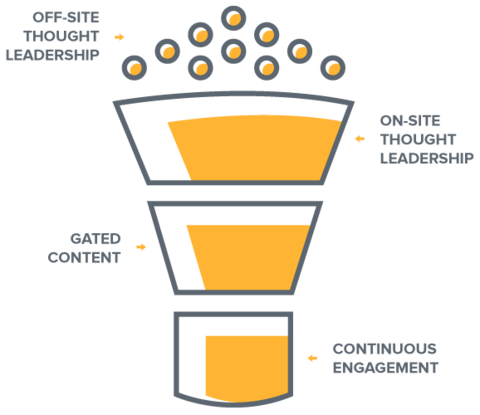 Here’s an domain authority report for the Content Marketing Institute as an example. The higher the number (it’s on a scale of 0 to 100), the better. 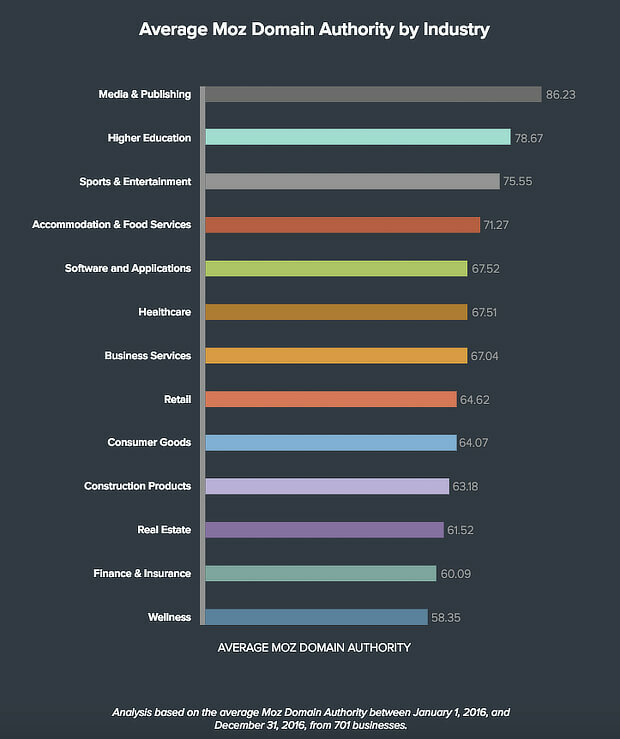 Moz doesn’t say what counts as a good domain authority figure, but SmartInsights has created a useful chart of the average domain authority in different industries. 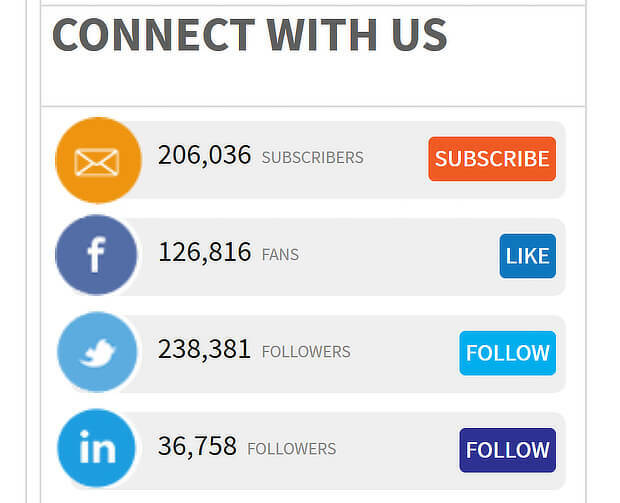 Check for email subscriber and social follower numbers. Most site owners publish these if they’re big enough, and it’ll give you an idea of the size of the potential audience you could reach. If social follower numbers aren’t on the site, check out their social media profiles yourself and see if the site owners have an audience, and whether they actively promote all content published on their site (including guest content). Look back over a month’s worth of content and you should be able to work this out. Use Alexa to check site traffic over the last couple of months. You can simply type the URL into the on-screen box on the home page, and you’ll get a quick overview of key traffic metrics. This will tell you how many people could see your guest blog post, and where most of the site’s audience is located. If most of the site’s traffic comes from the UK, and you’re looking to reach prospects in the US, it’s likely not a good fit for your guest posting strategy. Next, look at the posts themselves. See if the content published is a match for the topics you want to write about. Don’t worry if comment numbers are low; that’s true of many sites these days. And even if the number of social shares isn’t impressive, a site that reaches your ideal target audience can still help you meet your goals. Check out the author bios at the end of guest posts, to make sure you’ll be able to get appropriate credit and send readers back to your site, as in the example below from the OptinMonster blog. We’ll look at how to create a great guest blogging bio later in this guide. Before you approach site owners to suggest a guest post (known as “pitching”), you’ll need to form a connection with them. Don’t be fooled by all these guest post pitch templates you see online; for most site owners cold pitches won’t work unless the content is stellar. In fact, many site owners are so tired of irrelevant pitches and poor quality content that they’ll only take guest content from people they already know, like and trust. Here’s how you can become one of those people. 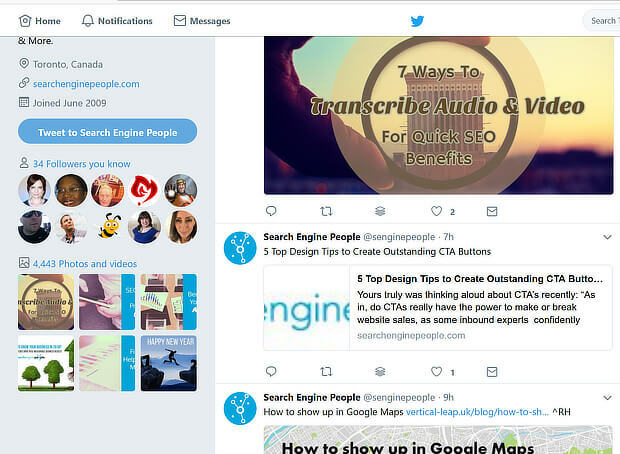 First, get to know their site and the type of content they publish by following them on Twitter, where many people share their content, or by subscribing to their site in Feedly, so you get updated whenever there’s something new. Connect with site owners on social media, so you can tag them when you share their site content. Share anything you really love, and include a comment so it’s not just a plain link. Comment on their blogs, sign up for their email marketing newsletter and respond to their emails. The point is to form a genuine relationship with the site owner. Don’t fake it; they’ll figure it out and then you won’t achieve your goals. Once you have a good understanding of your target site, and what matters to the site owner, it’s time to find a topic to pitch. To find popular content with Buzzsumo, type the site’s URL into the search box and you’ll see the most shared content. You can do the same thing with a topic, by typing the topic keyword phrase into the search box. If you find a topic that’s widely shared, and relevant to a site, but hasn’t yet been published on your target site, that’s a good topic to kick off your guest blogging strategy. Looking for an edge when choosing your topic? The research shows that in-depth content, posts that use proprietary research and posts that share experiences and life hacks tend to be popular. One last thing: if the site has guidelines for pitching and writing, read them. If you don’t, site owners might just reject your pitch before even reading it. For your guest blogging strategy to succeed, it’s important to avoid generic guest posting pitches. If you’ve done your homework as we suggested earlier, you’ll be able to craft a winning pitch that’s personal to each site owner with very little effort. The first rule is keep the pitch short and to the point. Site owners, especially those with authoritative sites, get a LOT of pitches, so don’t waste their time. Second, use their name – most site owners won’t read pitches from people who can’t be bothered to research this basic contact detail. Third, include the post title. In fact, some successful pitches use this in the email subject line and as a secondary heading within the body of the email. 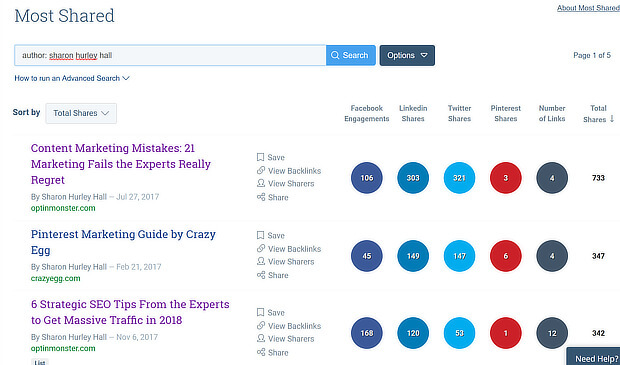 The information you got from Buzzsumo when choosing a topic also gives you a snapshot of popular headlines. Use this as a starting point for coming up with your own, and nail the right headline with this list of headline tools. If the person you’re pitching loves your title, you’re halfway to a successful pitch. Next, describe the post briefly. Say what it will cover in a couple of sentences or a few bullet points. Say how this piece of content will help their readers. Since by now you’re familiar with their existing content, this will be easy to do. Finally, show why you’re the right person to write the post. Note, this isn’t a resume; just hit a couple of high points. Here’s one example of how this would work. Remember, this is not a guest blogging template. Craft your own unique pitch for the site you want to reach, using your own natural tone and language. If your pitch is accepted, the next thing to do is write your guest post. Especially if it’s the first time you’re writing for a site, you want to make it better than your best. We use headlines like those on the OptinMonster blog, and our readers love them! Here’s a guide to writing great headlines to help you nail yours. Site owners will love it if your guest content ranks well in search engines and drives traffic to their site. 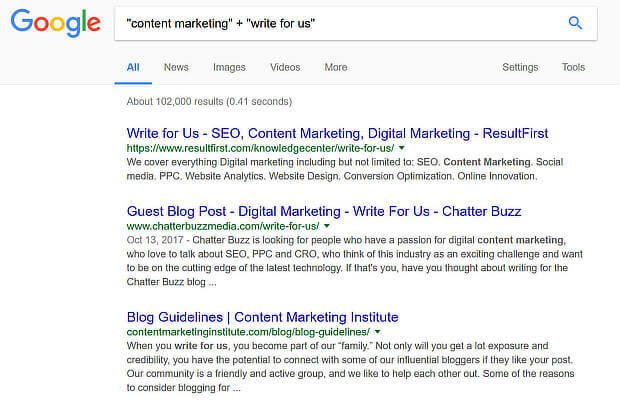 So, just like you’d do for your own content, carry out some keyword research to find a couple of core phrases you can use to optimize it. Good keyword usage (not stuffing) shows search engines that content is relevant, which helps searchers find it – and you. Read our full keyword research guide for help with this. Ideally, your guest post will have a great link profile, which helps with SEO and building authority. That means you should include relevant internal and external links in the guest post you’re writing. Within the content, link to great content from the site you’re writing for, and useful resources on external sites. This helps give the content a good link profile, which is also good for SEO and building authority. Make sure you follow any linking guidelines set out by site owners. As you’ll see when we get to the bio section, some limit links. Finding images can be a hassle, so unless site owners prefer to do this themselves, help them out by including or suggesting relevant images for your guest post. These will underline your main points and break up the text to make it easier for readers to scan. For help with getting high quality images for your guest blogging strategy, use our guide to free image sites. Finally, format the post so it matches others on the site. Make a note of how they use subheadings, capitalization, bold text, lists, etc. 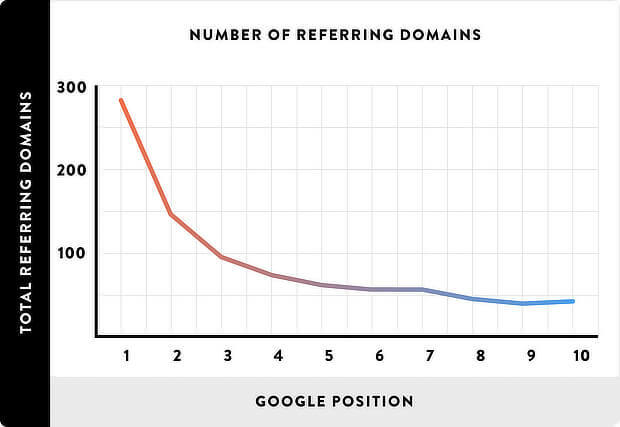 The less work you leave for site owners to do, the more popular you’ll be. Some sites provide guidelines for guest post writers, in which case, all you need to do is follow them. There are even a few site owners who put no restrictions on links in the bio, though that’s not very common. 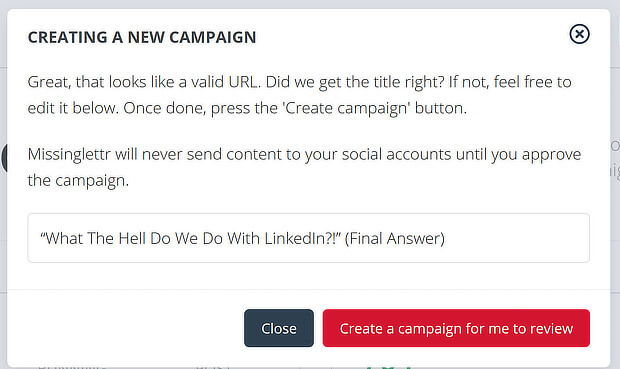 In most cases, you’ll be able to link to a URL of your choice plus a social link. 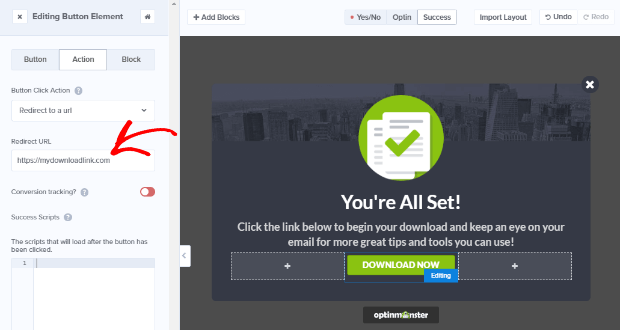 OptinMonster’s a great way to deliver your lead magnet. Follow our guide to creating your first campaign, then visit the Success tab in the OptinMonster campaign builder. You can deliver the lead magnet immediately via a success theme or a link, and can also send it by email. OptinMonster’s Referrer Detection feature is another useful way to capitalize on traffic resulting from your guest blogging strategy. It allows you to show specific campaigns to people coming from a particular site, without needing to create a whole landing page. Follow our instructions for creating your first campaign, then go to Display Rules » Current URL path » exactly matches. Add the URL of your guest post. You’ll be able to track the success of your campaign in OptinMonster’s conversion analytics dashboard. If you can, add UTM parameters so you can check the success of each guest post in Google Analytics. That’ll tell you which sites are really working to meet your goals. 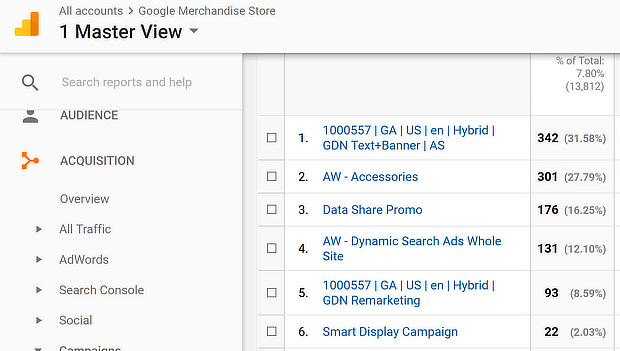 To see this data in Google Analytics, go to Acquisition » Campaigns, and you’ll see the different sources that have sent traffic to your site. We’re going to keep this next guest blogging strategy tip short and sweet: respond to comments on and mentions of your post. Why? Not just because it’s good manners, though that’s a good reason. But because being responsive is how you make connections with your new audience, which can help you meet some of your strategic goals. Blog owners will also be happy if you’re responsive, making it more likely they’ll be receptive to new pitches, or will suggest ways you can contribute further. This moves you even closer to achieving your goals for your guest blogging strategy. If the blog owner allows it, subscribe to comments on your guest post, so you’ll get an email alert when anyone comments. You can also track mentions and shares of the post via a Google alert. Content promotion is a key part of your guest blogging strategy so more people read your content and follow it back to your site. The site owner will be happy to benefit from increased traffic, too. You can promote guest blogging content via the same channels you use for to promote your own content. For example, you can let subscribers know about it in your email marketing newsletter and share guest posts on social media. Encourage your subscribers and followers to visit, comment and share. Some will be happy to oblige. If you’re promoting content via Buffer, add those posts to your queue. And you can also run a drip marketing campaign by adding your guest post to Missinglettr, if you’ve got the right plan. To do that, login to your account, and click the Add blog post button. Enter the URL of the post and press Next. The site will offer to create a drip campaign. Your guest post will be shared at intervals over the next year. While one guest post will help you achieve your aims, for real success you need to write many. With a good guest blogging strategy, more is more, as long as you can maintain the quality of your guest articles. The more posts you write, the more online presence you have, and the more people think of you as an authority. That leads to more invitations to write and participate in events, more traffic to your site, and more leads and sales. Of course, if you’re writing a lot of guest posts, you’ll need a way to keep track of them. That’s why it makes sense to have a guest blogging calendar. An easy way to do this is to create a new calendar in Google Calendar, and add the titles and due dates of any guest blogging commitments. If you’re writing for a few publications regularly, use color coding to have an easy visual guide to what’s coming up for whom. You can even make a note of when posts are scheduled to be live (adding them in a different color, of course) so you can kick social media promotion into high gear. Other tools for tracking your blogging commitments include Asana and CoSchedule. If you want to know if your guest blogging strategy is working, you’ll need to measure success. This means using some of the tools mentioned earlier in this guide. For example, if you want to see if your content is bringing in more leads, track traffic to your landing page with Google Analytics, and use OptinMonster’s conversion analytics to assess the success of your marketing campaigns. Search Buzzsumo as described earlier to see if your guest content is being shared on social media. Buzzsumo also lets you set up an author search so you can track all your guest content from one place. To do this use author: [your author name] in the search box. Use SEMRush as described earlier to see how your guest content ranks for target keywords and if you’re getting new inbound links and related traffic from your guest posts. That’s it! Now you know the steps to create an effective guest blogging strategy, learn how to avoid key content marketing mistakes and track content marketing ROI. And don’t forget to follow us on Twitter and Facebook for more in-depth guides, tips, and resources. I’m not such a fool to declare that “Guest Posting isn’t effective”. But the problem is that now a days guest post publishing becomes a business. Because of the Link Factory, site owners are now conscious enough about the value of a guest post. So, they ask for a big amount to publish a post from the guest. However, your tips are awesome. Hope you’ll publish another great article describing the way of getting more social signal. Best Wishes. Thanks for such a wonderful article. Its really helps to blog the best post for the audience.